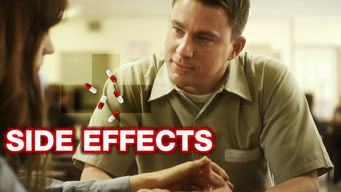 How to watch Side Effects (2013) on Netflix Argentina! Sorry, Side Effects is not available on Argentine Netflix, but you can unlock it right now in Argentina and start watching! With a few simple steps you can change your Netflix region to a country like South Africa and start watching South African Netflix, which includes Side Effects. We'll keep checking Netflix Argentina for Side Effects, and this page will be updated with any changes. Side Effects is not available in Argentina BUT it can be unlocked and viewed! When a young wife's depression spirals out of control due to her husband's prison release, she turns to a new medication that alters her life forever. Murder and medicine make a lot of trouble for this doctor who's caught up in a scandal he doesn't yet understand. There is a way to watch Side Effects in Argentina, even though it isn't currently available on Netflix locally. What you need is a system that lets you change your Netflix country. With a few simple steps you can be watching Side Effects and thousands of other titles!